Six grandchildren can turn a house from calm to crazy in seconds when they awake on Christmas day! 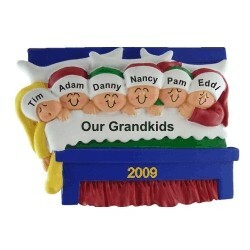 Those special memories are captured in the 6 grandkids snuggled in bed personalized Christmas ornament that's perfect for the holidays or any time at all. These festive, handcrafted grandparents ornaments personalized by hand as well arrive with a display cord and our lovely velvet gift and storage bag. Celebrate the joys of young grandchildren with the 6 grandkids in bed Christmas ornament personalized to always be cherished.